The second annual LLP Tournament is an opportunity for our students and coaches to display their incredible progress on and off the basketball court. Beginning on March 16th, our 1,387 youth from 17 different schools currently enrolled in LLP started a month long tournament. 22 of 28 games were completed before students headed home for the Easter Holiday. The tournament will resume on April 13th with 36 more games scheduled, and the finals will be featured during the Hoop Forum event (May 19-21). This year, under the supervision of SEED Athletic Director, Moussa Toure, the tournament introduced several format changes. To increase competitiveness and emphasize the fundamentals of the game, the first two rounds of the tournament featured teams of 3x3, the semi-finals 4x4, and the finals 5x5. This format was designed to show the students how to properly space on the basketball court, while allowing equal opportunities for each player to touch the ball and participate on the team. Additionally, this format allowed for coaches to better asses and teach their players. Over the past several months, SEED coaches have been preparing for the FIBA certification exam in April in hopes of becoming FIBA certified coaches. 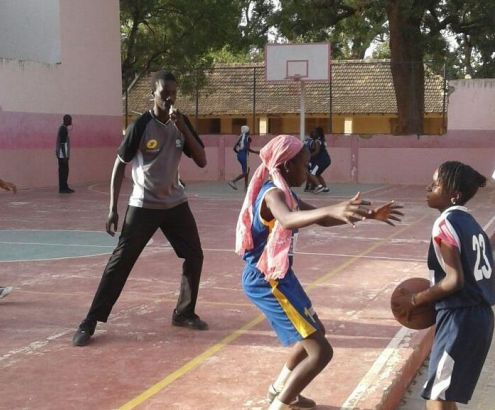 FIBA certification will make SEED coaches eligible to coach Senegalese national teams.